US stocks saw inflows worth $5.2 billion in the week that ended on July 15, while Japanese equities experienced big, $5 billion inflows. For Japanese stocks, these were the largest inflows since April 2014; the asset class has seen inflows in 20 of the past 21 weeks. European equities, which have seen inflows for nine weeks in a row, received another $3 billion. Emerging markets equities experienced the largest outflows in five weeks, with $6.8 billion going out; $5.3 billion of these left Chinese equity funds, after last week’s record inflows into Chinese mainland A-shares. This could signal that investors have little faith in the Chinese authorities’ attempts to prop up the markets. 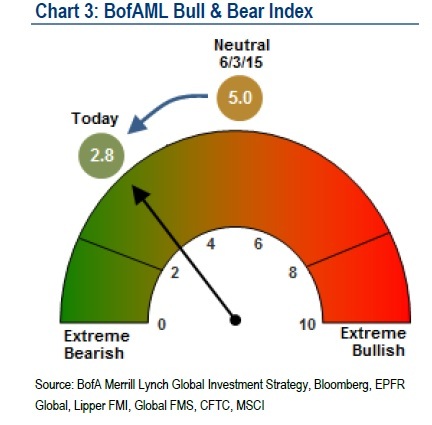 Sentiment was little changed from last week, with Bank of America Merrill Lynch’s Bull & Bear Index very close to the “buy” signal for risk assets. Investment grade bond funds saw sizeable outflows, worth around $2.3 billion. These were the largest outflows from the asset class since December 2013. High-yield bond funds saw their first inflows in six weeks, of $1.3 billion. Emerging market debt funds also saw outflows of $500 million. Emerging market bonds saw outflows in seven of the past eight weeks. The volatility in Chinese markets has reverberated in the commodities space, which has been badly affected by fears of slowing growth in the world’s second largest economy. Commodities saw $217 million leaving in the week that ended on July 15. Analysts at Bank of America Merrill Lynch noted that worries over Greece, China and Puerto Rico have not prevented the “big rotation” out of bonds — which saw $24 billion leaving since late May/early June – and money market funds, which saw $26 billion going out, and into equity funds, which have seen $48 billion since then. The strong May US payrolls report reassured investors about the US recovery and signalled that the Federal Reserve will be able to raise interest rates this year. Fed Chair Janet Yellen said again last week that the central bank stands ready to lift rates this year.